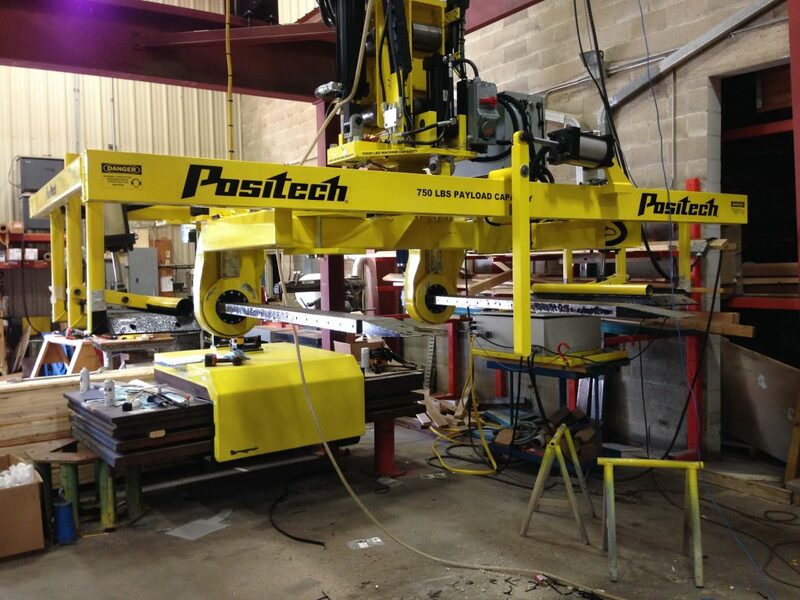 Positech has designed a Laser Table Manipulator to help aid in the handling of steel plate materials in the loading and unloading of a laser cutting process and to separate cut parts from the remnant. 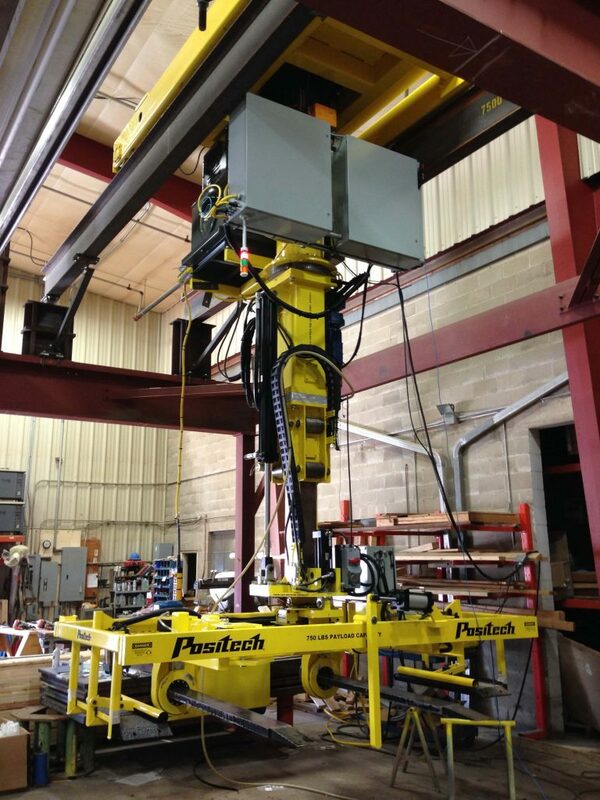 Problem: Steel sheet handling, sheet range in thickness from 22 ga to 1″ and weigh up to 700 lbs. 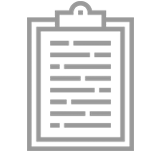 Cut parts are cleared from the skeletons as follows: Light sheets are shaken like a blanket, medium sheets are manually hammered or impacted with an air chisel and heavy sheets are lifted and shaken with a forklift with no way to secure the sheet on the forks. The sheets are awkward, heavy, and hard to handle due to their size, causing ergonomic issues and back and shoulder injuries. It takes multiple operators to distribute the work load and handle the large skeletons. Application: Laser cut steel sheets are ejected from two (2) laser cutters onto table risers; at on of the two unloading stations. The cut parts remain within the skeleton of a 5′ x 10′ sheet of steel. At each unloading station there is an upper and lower ejection table that deliver the sheets to the operator. The parts are attached to skeleton by tabs designed to secure the parts during the cutting process. 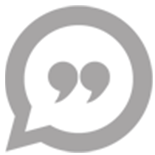 At the unload stations, the operators shakes, hammers, vibrates, chisels, or use a fork lift to bounce the loaded skeleton in order to dislodge the laser cut parts from the sheet. Once the sheet is cleared of all the parts, the skeleton is discarded in a scrap bin outside of the area. 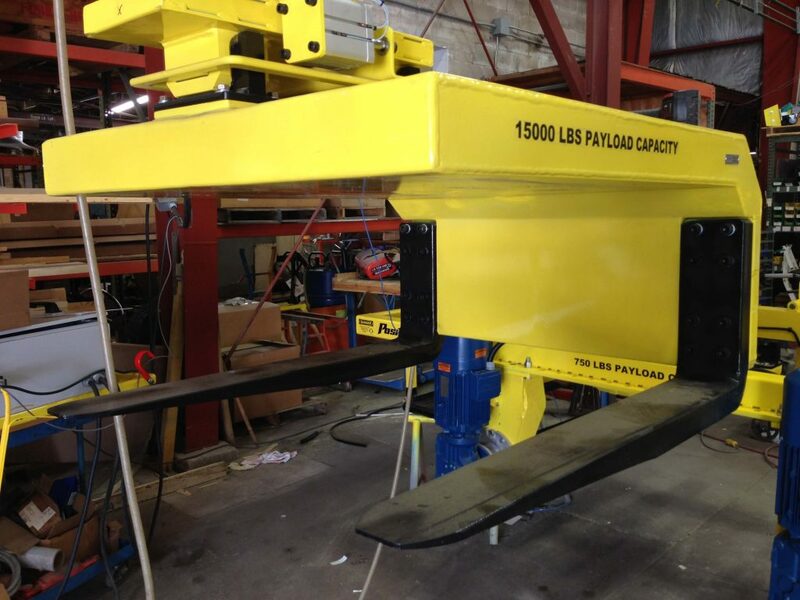 Solution: Positech square post lifter with electric drive trolley mounted on a 10 ton dual girder bridge system and overhead mounted runway structure capable of covering the entire 3,000 sq. ft. work cell. The unit is operated by wireless remote control, allowing the operator to maneuver the equipment from a safe distance. 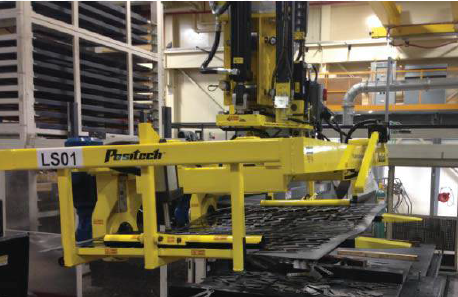 Included in the solution were two quick disconnect tools; one tool was designed to load the laser table with multiple sheets weighing up to 15,000 lbs. the single sheet handler tool is capable of shaking sheets of varying thicknesses, weighing up to 700 lbs. each, dislodging the laser cut parts within seconds, dropping them onto the collection surface at each unload station and then depositing the skeletons into a dumpster. To download a PDF of the Laser Cut Steel Sheets Case Study, please click here.